GOLD PRICES slipped in Asian and early London trade Tuesday, holding near 4-week lows for US Dollar investors even as bond yields also retreated with global stock markets. Monday's steadier manufacturing data from China, plus the very weak reading from Europe, were followed yesterday by a surprise jump from 2-year lows in the ISM's US activity index, with the Prices Paid index rising sharply. With the UK Government of Theresa May meantime meeting for 5 hours today to try and find a way forward on Brexit, the UK gold price in Pounds per ounce traded near 2-week lows at £984 despite chief EU negotiator Michel Barnier saying that a "no deal" Brexit on April 12 is now looking very likely, carrying "significant risks for the EU" as well as the UK economies. Among major European bourses, only the UK's FTSE100 index of mostly global corporations moved higher, adding 0.5% as the Pound held in a tight range near $1.30 – a three-decade low when first hit on the result of June 2016's Brexit referendum. Gold priced in US Dollars held at $1286 per ounce, down $5 for the week so far, while Euro gold prices held little changed at €1148, some 2.0% off Wednesday's 4-week high. "The macroeconomic and geopolitical backdrop has gradually become more favourable towards gold over the past six months," says the new Gold Focus 2019 from specialist analysts Metals Focus. "This supportive backdrop should encourage professional investors to remain net buyers overall during 2019." 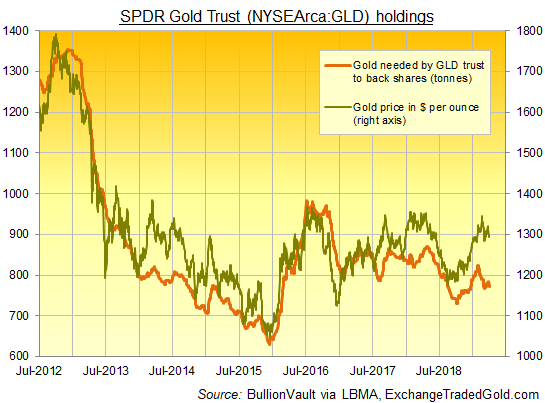 However, the giant SPDR Gold Trust (NYSEArca: GLD) – the largest gold ETF in the world – yesterday saw its largest 1-day liquidation in a month, nearly matching its largest outflow of investor cash since February 2018 to need 11.5 fewer tonnes of bullion backing at a 2-week low beneath 773 tonnes. Australia's Perth Mint says it sold 9.6% more ounces of gold in March than Feb, but the first quarter of 2019 was still the weakest since at least 2015 on data compiled by Reuters, running 10.8% below Q1 2018. BullionVault saw an upturn in private-investor sentiment last month, but UK households in particular remain shy of buying gold despite the approach of Brexit. "One critical factor behind the recent price recovery [in gold] has been the shift in consensus expectations for US interest rates," Metals Focus goes on, noting recent US Fed comments and forecasts. "We expect US real GDP to slow in 2019 and 2020," explains Metals Focus director Nikos Kavalis, reflecting "a natural tapering [after] two very strong years, the fading of windfall gains from the late-2017 tax reforms and, eventually, also the impact of trade wars on US consumer spending." But "concerns we saw emerge in the past few weeks around economic growth have certainly eased," says Australian bank ANZ's analyst Daniel Hynes, speaking to Reuters, "and that shift in the past day or two resulted in little bit of selling in gold market. "Most of the global growth is coming from China and the [manufacturing] data over the weekend eased those concerns." Interest-rate traders overnight saw a 31.9% chance of the Fed leaving its key policy rate unchanged by January 2020, according to data compiled by the CME futures exchange, with all other bets looking for a rate cut by then. Just 1.0% of current betting however sees a cut to rates of 1.5% or lower over the next 9 months.